In the words of Peirce Lewis, Latrobe has become "our unwitting autobiography, reflecting our tastes, our values, our aspirations, and even our fears, in tangible, visible form" (Lewis 1979). Current industrial land use practices in Latrobe, such as mining operations and dairy farming, come with tremendous environmental costs. Recent reports state that Australians, on average, produce over 20 tonnes of C02 emissions per person per year, ranking the country as the world's highest carbon dioxide polluter. Beyond greenhouse gas emissions, mining operations are a large source of surface and groundwater pollution. Large amounts of water are extracted from local aquifers for mining operations and irrigation-based agriculture, causing destabilization of soil conditions, increasing the chance of river bank failures, and making the area more prone to flooding and seismic activity. Moreover, intensive cattle and dairy farming operations produce enormous amounts of manure which is currently disposed of in inadequately sized and lined lagoons or storage structures that allow pathogens to escape into the surrounding environment. The result is an unsustainable landscape that privileges short-term economic gain over human and environmental health. However, Latrobe's identity on both the local and global level is one that is so deeply rooted in its mining tradition that to deny its significance in the valley's future is equally short-sighted. By proposing a gradual shift over time from the current coal oriented energy economy and opening up its remnants to its people, this project honors the rich and storied history of the region while responding to the need for cleaner energy alternatives. Reassembling Flows thus aims to change this paradigm by repurposing existing infrastructures, optimizing resource utilization, and structurally integrating ecosystem services into design processes across multiple scales. 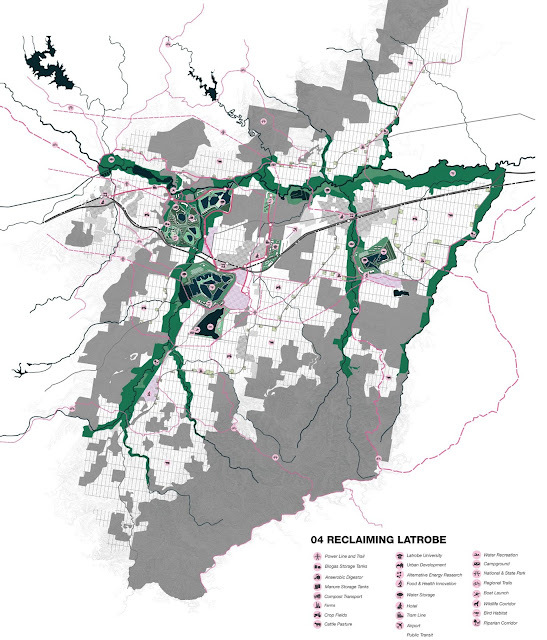 Understanding Latrobe Valley as a complex system of interconnected flows of industrial processes, ecological systems, and cultural networks allows for the transformation of currently discarded "waste" byproducts from these processes into valuable resources--creating opportunities from liabilities. 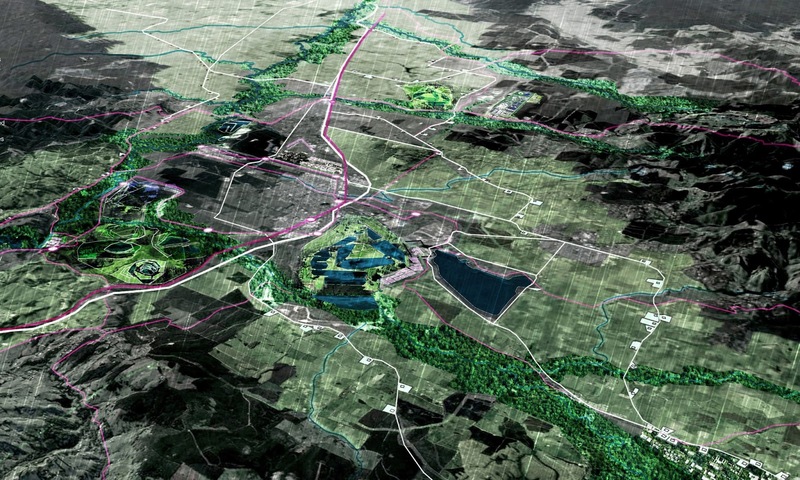 No longer an exploited landscape of extraction, Latrobe becomes a key part in an extensive network of social, environmental and economic exchanges that extends throughout and spatially connects the Gippsland Region. Peirce F. Lewis, “Axioms for Reading the Landscape: Some Guides to the American Scene,” in The Interpretation of Ordinary Landscapes edited by Donald W. Meinig (Oxford University Press, USA): 1979.